Know about the human generated risk of contamination in cleanroom area of sterile and non sterile manufacturing and methods of its control. Cleanroom contamination is a major problem in sterile manufacturing and it is difficult to maintain the cleanroom area. People working area is the major source of contamination. Air born particles are the cause of contamination in the classified areas. Equipment and movements of people in the cleanroom generate the particles. Particles are generated during the manufacturing processes as sifting, milling, granulation etc. Viable particles (bacteria, fungus etc.) are always associated with these non-viable particles of dust generated during the manufacturing process. It is very easy to control the contamination generated by the people working in the area by aware them about the control of the contamination and its control. Human hairs, dandruff, fingerprints and even breathing are the major source of the contamination those can be controlled. ● Equipment and items those are not required in the manufacturing process should not be allowed in cleanroom including the keys, cosmetics, tobacco, jewelry and other personal items. ● Food and drinks should not be allowed. ● Chewing tobacco and chewing gum etc. are not allowed in cleanroom areas. ● Hairs should be covered properly. ● The handshake and hand rubbing should not be done in the area. ● Special approved ball pen and paper is used to record the data. ● Tissue papers should not be allowed in the area, lint-free tissue or cloth may be used. ● Doors should be closed properly during the manufacturing process. ● Line clearance must be taken before starting any manufacturing process. ● Pressure differential should be maintained during the whole manufacturing process. ● Air flow pattern and air velocity in the room should be adequate according to the grade of room. 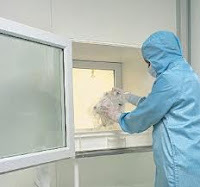 Therefore, human activity in the cleanroom area must be controlled to protect the area from the contamination and to maintain the classified area properly.